If you are a carnival lover, you can not miss one of the most popular in Catalonia: the Sitges Carnival, an event where you will always find the most wild costumes, fun until late night and the best rhythms by the carnival groups that liven up the party. The best of this celebration can not be explained, it has to be experienced! 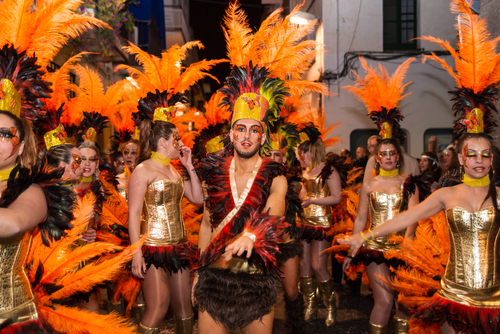 That's why you should know the dates of the Sitges Carnival 2017: from February 28rd to March 6th the streets of the city will welcome again one of the most massive carnivals. It is expected over 2,500 participants, 50 floats and more than 300,000 people eager to enjoy all the special events. It is important booking apartaments for the Sitges Carnival in advance if you want to celebrate it without worries and total tranquility. However, you can also arrive by public transport (but being dependent on the train and bus schedules) and, of course, by car. It is essential to know where to park in Sitges in carnival although public car parks and blue areas are often full. On Dijous Gras (Fat Thursday) the local people eat egg sausage and pork crackling cake, but also it is the day of receiving His Majesty Carnestoltes. The Carnival King inaugurates the carnival celebrations through his speech, which he always encourages people to disguise themselves, dance, laugh and feasting without limits. It is also the moment of the presentation of the Carnival Queen, who is chosen a few days before. March 2nd 2019: the "Tequereuqe Festa"
It is a preamble to the great parade of the Sitges Carnival of 2019. In the afternoon a batucada group will tour the historic center of the city reminding everyone that Sunday and Tuesday costumes and smiles will take the streets of Sitges. One of the most bizarre activities of the carnival is this fun race, in which every 5-person team has to cross a circuit. The only condition is that one of the participants has to race on a bed. The children's parade is responsible for livening up the carnival during the day, and the "rua de la disbauxa" (wildness parade) invades Sunday night with its spectacular floats and the participation of several "collas" (groups) with their best costumes. Get ready for an explosion of confetti and dancing party. One more time the children's parade jumps into the street in the morning for the whole family. A good opportunity to celebrate the Sitges Carnival with children. However, the highlight of the whole carnival is reserved for the Shrove Tuesday (or Mardi Gras), the big night with a big crowd because of the "rua de l'extermini" (extermination parade). A “must” event for those who want to live a real carnival. Unfortunately everything comes to an end, and on Ash Wednesday the death of the Carnival King is represented by the burial of the sardine. His coffin is strolled through the streets of Sitges while his widows follow him to the place where the testament is read and the coffin is burned. This act supposes the end of the carnival until the next year. As a gay tourist destination par excellence, the city also celebrates the Sitges gay carnival a few days before the regular carnival and continues during the celebrations mentioned above. The Pink Night, the Mantillas Night, the Tourist Night and the Widows night are only some of the special parties that are celebrated by the gay bars and discos of the city as Sauna Sitges, The Parade or La Locacola, among others. ¡Do not hesitate and come to celebrate the carnival in Sitges!